We show here a representative collection of projects conducted by scientists and engineers at Wavelet Technologies. This page will be updated with new projects from time to time, so check back for new developments. Papers and publications showing more details on many of these projects can be found here, and new material will be added on a regular basis. The upper pane is Non-Invasive Blood Pressure (NIBP) oscillometric data (mm Hg vs sample) taken using a blood pressure cuff. The lower pane is the Discrete Wavelet Transform (DWT) of the oscillometric data, computed using a Daubechies wavelet with amplitude represented using a color code. Wavelet transforms code both the scale of the signal and amplitude measured in terms of the wavelet mother function at that point. Applications of wavelet-based digital signal processing (DSP) methodologies were one of the first business areas of Wavelet Technologies and is still an on-going field of work for our scientists and engineers. 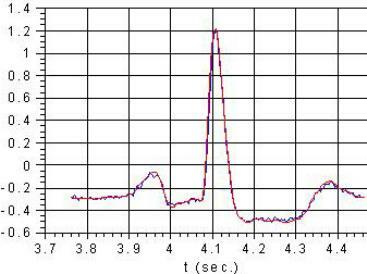 Wavelets are often useful for physiologic waveforms, among other reasons, because the waveforms are pulses or pulse trains and wavelets (usually) have finite duration. 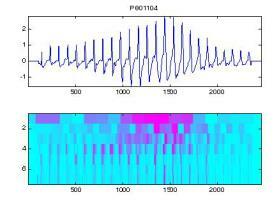 A single beat of EKG data (electrocar-diogram) data compressed and recon-structed using Associated Hermite wavelets. The original signal is in blue and the reconstructed signal is in red. The signal amplitude is in millivolts. Another application of wavelet-based algorithms is in compression of medical data, especially when large volumes of data must be preserved, as produced by central monitoring stations of intensive care units for example. This algorithm, developed at Wavelet Technologies, produces 12:1 compression, while retaining sufficient accuracy for clinical diagnostic purposes. 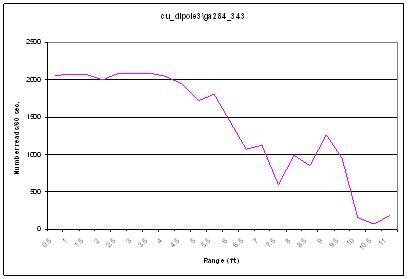 Some modest reduction of electrical noise in the signal is also obtained. This image shows the propagation of a scalar wave field from a point encountering a square obstruction and a round impedance (10x). 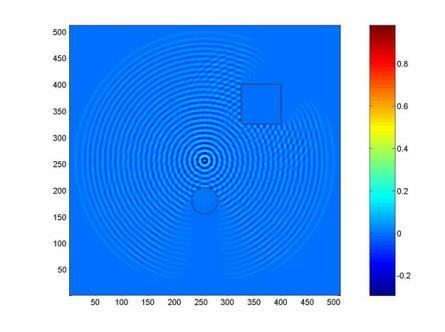 The propagation was computed on a 512x512 grid using Wavelet Technologies' proprietary wave propagation code that can be used for both acoustic and electromagnetic wave propagation problems. This algorithm is especially useful for complex problem geometries in two and three dimensions. This simulation was stopped before the wave encountered the simulation boundary, but in general a very efficient absorbing boundary condition can be used to simulate free space. Wavelet Technologies has conducted several projects in RFID (radio frequency ID), including a development project for the US Navy. 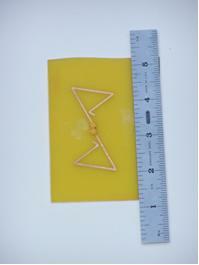 Above is shown a prototype tag fabricated at Wavelet Technologies (on FR4 substrate) and read range testing of this tag. At Wavelet Technologies we have used genetic algorithms for various optimization and design problems, most importantly in the design of antennas, particularly compact and wide-band antennas of various types. 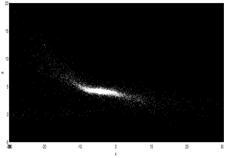 We are extending this work in genetic algorithms and adding work in the related area of grammatical evolution, which appears to be advantageous for identifying trading algorithms in quantitative finance. 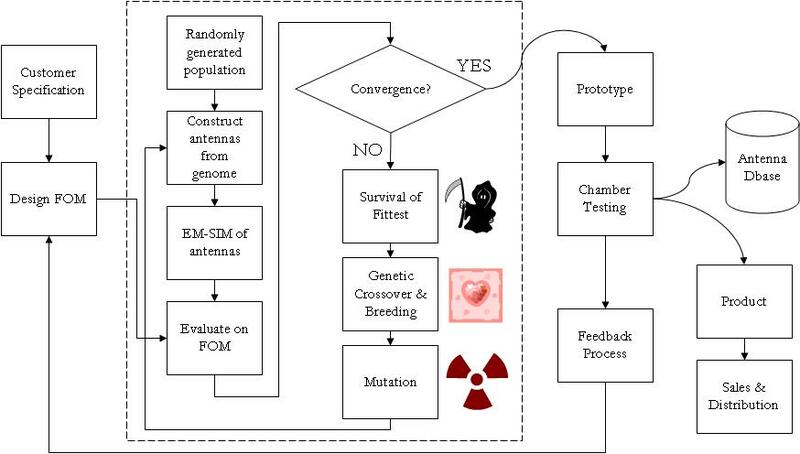 The above is a flow chart showing the operation of a genetic algorithm for antenna design. This project required design and construction of a two-axis antenna positioner operating under software control together with custom software for automated control of a network analyzer and data analysis of antenna parameters. The system involved mechanical and electrical engineering as well as software engineering in LabVIEW, all carried out by Wavelet Technologies workers. This system was successfully constructed, demonstrated, and used in an anechoic chamber designed by Wavelet Technologies for a customer and constructed by that customer on-site under our supervision. Early stages of the positioner fabrication and testing are shown above. An N-particle simulation of a galaxy is shown that has been warped by the gravitational pull of a companion galaxy (outside the frame). This work was carried out with collaborators at Boston University, University of Maine, and Universite Laval. Wavelet Technologies has extensive experience in parallel and cluster computing going back many years. In addition to work on parallel supercomputers, we have considerable experience in cluster and multi-core computing. For example, our proprietary genetic algorithm has been implemented both in cluster and multi-core environments. We are now beginning work to exploit the computational power of GPUs (graphical processing units). Wavelet Technologies has an active program of development in digital active noise cancellation making use of novel algorithms.